After work, Jon and I took Wizard for a hike in the park. We did the usual short loop, ending at the log cabin, and it took about 30 minutes. In the morning, my back was really locked up, but it loosened with the walk. By the time we got back to the barn, it was dark and the fireflies were out. Life is good. I RODE- YESSSSS!!!!! Wizard and I went out on a walk in the park with Cathy and Miss Tuesday. We were out for about 35-45 minutes, walking through the mulberry bush field and up the “bowling pin” field. Wizard was SO, SO full of energy, but he was polite enough to remember his training and contained himself to a walk. My back is slowly healing- the ride felt great. On Thursday, I saw the neurologist, and she said she expects my back to be close to normal in about 2-4 more weeks. If it is not going in the right direction in two weeks, I have to do another MRI. I’m diligently doing my physical therapy exercises, and they seem to help. The “bomber” flies are out in force, and I gave Wizard an abbreviated bath, smeared him with GNatural (love that stuff! 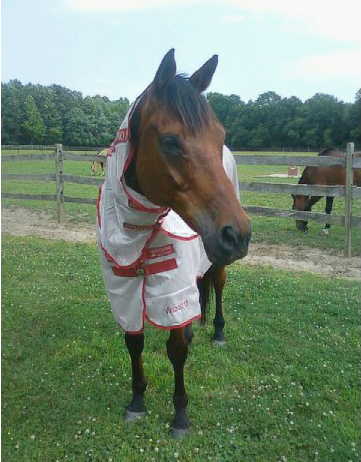 ), and put his fly sheet on. He looks like a spaceman.